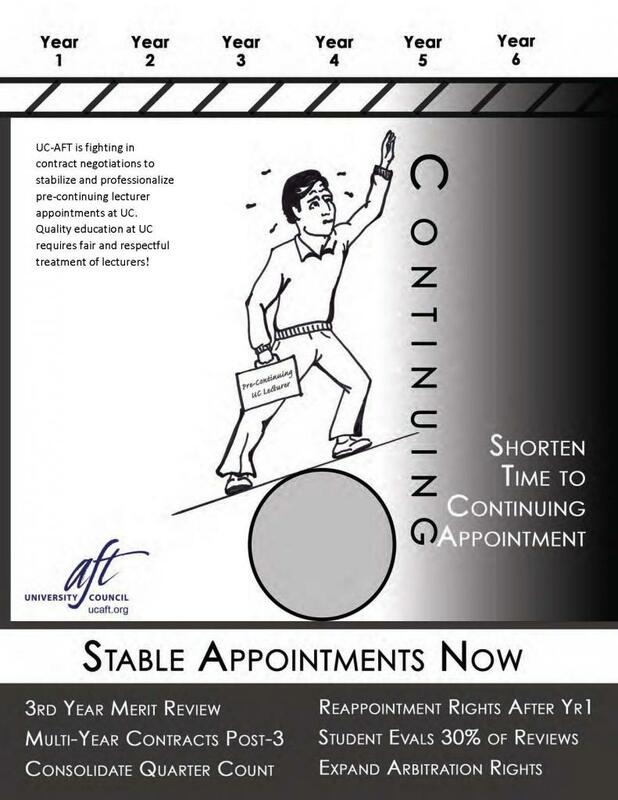 Home»UC-AFT Insider: Back in Session--Let’s Organize for Bargaining! UC-AFT Insider: Back in Session--Let’s Organize for Bargaining! Back In Session—Let’s Organize for Bargaining! Unit 18 contract negotiations will continue into the Fall term with dates scheduled through the end of October. The next session will be at UCLA September 21-22. Local 1990 at UCLA is arranging for member observers and a bargaining support rally at noon on Tuesday Sept. 22. You can show your support for better contract by printing and posting this flyer outside your office (drag to desktop). We’re also asking members to wear Teaching Matters buttons on bargaining days. Contact your field rep to get a button. In the bargaining session at UCSB on September 3-4, UC negotiators made it clear that lecturers should not consider these positions as a career or even a pathway to a career and that they prefer an unstable, at-will pre-continuing lecturer pool. We reject this position because it is indefensible on any grounds having to do with quality of instruction, and our members suffer during six years of unnecessary contingent employment. We need your help to organize for a better contract. Please contact your local officers today to find out how you can get involved. UC-AFT members welcomed new students to campus during Move-In weekend at UCB and UCM. We shared information about the ways that lecturers and librarians support students and about our struggle at the bargaining table for quality education at UC. The response from students and their families was overwhelmingly positive! Please check out this brief report from Move-In day at Berkeley. Library administration across the UC system has been attempting to place librarian work in job titles outside of our bargaining unit. At UCLA, UC-AFT recently succeeded in getting three new positions, which had originally been classified as principal museum scientist, re-posted as librarian positions. UCLA is now attempting to remove thirteen librarians from our bargaining unit based on supervisory status. The case is going to PERB, where UC-AFT will fight to keep these positions and librarians in the bargaining unit. In another recent case at UCR, work by several UC-AFT members resulted in reclassification of three curators into the librarian series. Please check out this update for more details. UC-AFT President, Bob Samuels, testified at the Joint Legislative Oversight Hearing on UC Admissions and Enrollment. Bob asked the legislature why UC would accept a deal to exchange $500 million in new revenue from out-of-state tuition for $25 million in state funds to enroll 5,000 more in-state students. He also proposed better revenue sharing between campuses, enrollment targets, a transparent and accurate cost of instruction, and agreement on the types of instruction that state funding will support. You can view Bob’s testimony on our YouTube page. At the Investment Advisory Board meeting on September 9, the UC’s investment staff announced a $200 million selloff of coal and tar sands stocks. Student activists with Fossil Free UC have been campaigning for divestment, and our own Bob Samuels has pushed for divestment at previous Investment Advisory Board meetings. Bob’s most recent blog post comments on the potential of massive shareholder pressure to move investment choices toward socially responsible investments.